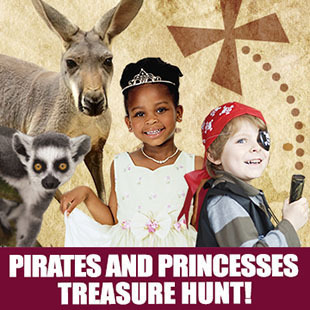 Adventure sets sail at the Long Island Game Farm — Wildlife Park & Children’s Zoo’s Pirates and Princess Treasure Hunt. The event is scheduled for Sunday, October 11, from 11 a.m. to 2 p.m., in honor of Christopher Columbus’ journey around the world and the park’s final weekend of the season. Only children (age 18 or younger) in pirate or princess garb will be included in the treasure hunt, but all attendees are encouraged to don their best ball gowns or swashbuckler attire. Prizes, photo opportunities with a real-life pirate and princess and complimentary refreshments will be available to all royalty and first mates who participate. Admission is $17.95 for adults and $15.95 per child, senior or military personnel. A $4 discount coupon courtesy of the Long Island Game Farm is available on the zoo’s Facebook page. In honor of the high seas adventure theme, The Priceless Parrot Rescue organization will be in attendance. A “take a pic with a parrot” booth will also be set up – donations for photo opportunities at this exhibit will fund Priceless Parrot’s rescue efforts. As a special treat, the Game Farm is also giving all Columbus Day Weekend (Friday, October 9 to Monday, October 12) visitors have a chance to get up close and personal with the park’s Bearded Dragons. Visitors are also reminded to bring with them a new or used children’s book(s), appropriate for grades one to seven, in support of Long Island’s local Butterfly Effect Project. The Long Island Game Farm features interactive animal experiences, where guests can get up-close and personal with their favorite animals. New to the Game Farm this year is the Camel Encounter, where guests can hand-feed the camels and learn fun facts from the staff. In addition to camels, guests can hand-feed the LIGF’s resident giraffe, and bottle-feed goats and other baby animals in the nursery.